You can modify the display of objects on a diagram using Diagram Filters, which you create and use through the Diagram Filters window. This window is dockable, so you can move it around or 'fix' it next to the Diagram View while you activate, deactivate and edit the filters. The 'Create New Diagram Filter' dialog displays. In the 'Enter Filter Name' field, type a name for the filter, then click on the OK button. The 'Diagram Filter' dialog displays. The body of the dialog displays a list of properties of elements, connectors or Tagged Values. 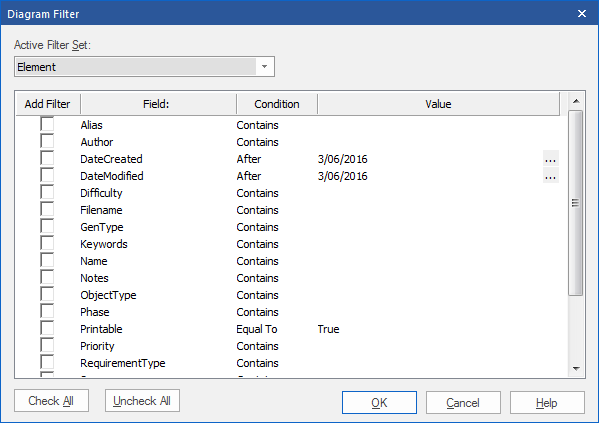 Scroll through the properties to filter on, and select the checkbox against each property you require. For each property, click on the 'Condition' field and select, from the drop-down list, the comparison condition to be applied. Consider how the combination of 'Condition - Equal To / Not Equal To' and 'Filter Effect' might affect the results on the diagram. For each property, double-click on the 'Value' field and type or select any specific value to filter on. Click on the OK button to save the filter and return to the Diagram Filters window. Unless you have specifically created the filter in a Filter Group, the filter is listed underneath the default Model group at the top of the window. In the Diagram Filters window toolbar, click on the drop-down arrow next to the Filter icon and select the 'New Filter Grouping' option. The 'Create New Diagram Filter Grouping' dialog displays. In the 'Enter Filter Name' field, type the name of the filter group, and click on the OK button. The filter group is added to the end of the list in the Diagram Filters window, and the 'Create New Diagram Filter' dialog displays for you to add a new filter to the filter group. Define the new filter in the group as described in the Create a single filter to be applied to your diagrams table. You can apply that procedure to define the other filters for the group, clicking on the group name and then on the 'New Filter' option to start. Alternatively, you can copy or cut an existing filter from the Model list or from another filter group, and paste that filter into the new group. Right-click on the source filter and select the 'Cut' or 'Copy' option, then right-click on the target group and select the 'Paste' option. The 'Diagram Filter' dialog displays; adjust the filtered fields as described in the Create a single filter to be applied to your diagrams table. Right-click on the name and select the 'Change Name' option. The appropriate 'Create New Diagram Filter ...' dialog displays. Type over the existing name with the new name, and click on the OK button. When you define two or more filters in a filter group, they default to operating in combination, with an AND relationship. That is, an object must satisfy the criteria of all the selected filters in the group before being operated on. Right-click on the filter group name and select the 'Properties' option. The 'Set logical operator for Filter Grouping' dialog displays. In the 'Operator' field, click on the drop-down arrow and select the required value - OR or AND. If the filter is for elements in the Package Browser or Diagram List, note that the 'Select' filter effect cannot show up in this context. To enable a filter so that it takes immediate effect on your diagrams, select the check box against the filter name. You can select more than one filter at a time, to combine their effects. For a Filter Group, if you select the group checkbox all filters in the group are selected. You can then, if necessary, disable individual filters in the group. To disable a filter and clear the effect of the filter on the diagram so that it displays in full, clear the checkbox. To add an existing filter to another Filter Group, right-click on the filter and select the 'Copy' or 'Move' option as appropriate. Then right-click on the target Filter Group and select the 'Paste' option. If you are moving a filter, it is not removed from the source group until it has been pasted to the target group. You cannot move a Filter Group or add one group to another. To disable the filters you have defined and simply highlight a selected element and its immediate relatives, right-click on the Diagram Filters window background or the diagram background itself and select the 'Context Filtering' option. To re-enable the Diagram Filter effects, display the Diagram Filters window or diagram context menus again and deselect the 'Context Filtering' option.